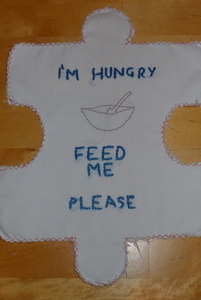 I am so excited about this craftivist jigsaw project supporting Save The Children Race Against Hunger Campaign, creating small jigsaw pieces with provocative messages. Years ago I took part in a big rally in London on the lead up to a G8 summit, calling for the government to Drop the Debt. Catching a bus from Norwich, one of many coaches which attended. I was struck by the wide variety of people who felt called to march. It felt exciting and positive to take part… to feel as though I was doing something concrete, expressing my voice, helping in a small way. On the run up to the next G8 summit meeting Save the Children are campaigning for David Cameron to take the lead at the next G8 summit meeting, setting plans to tackle child hunger, for David Cameron to follow through on his promise to lead the way in the Race Against Hunger. Sign Save the Children’s campaign here. 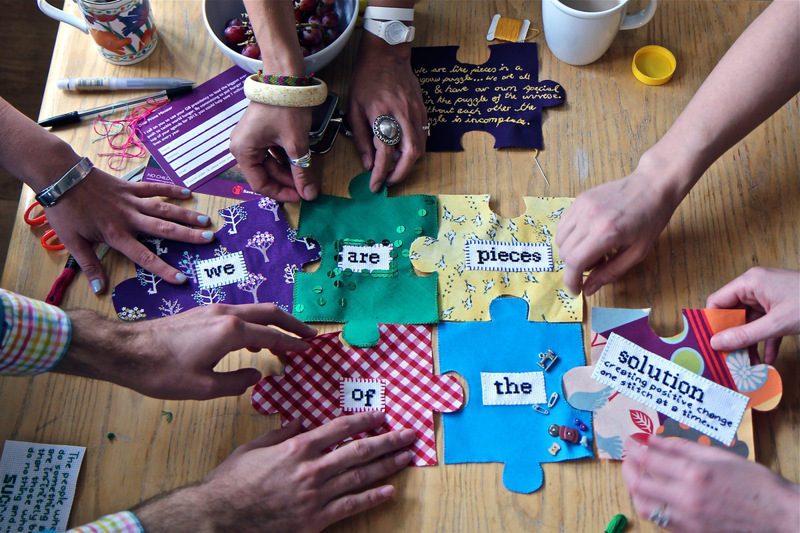 Plus why not take part tin the Craftivist big jigsaw… sew a jigsaw piece. As part of the project I’ve joined hundreds of craft-lovers in the UK who care greatly about world hunger; we want to use our hobbies to make time to think about the issues in groups, or alone, whilst sewing, and do positive campaigning to encourage MPs to be the change they wish to see in the world. This is my piece… but the ideas are endless, images of pieces already made can be seen at Flickr. Thanks to Mr X Stitch, Deadly Knitshade & Hilary of Craftblog UK who are joining the Craftivist Collective to take the lead. What a great idea to make the jigsaw pieces. I hope the school takes up the project.